User Tracker Count: 60 times. Gran Prix is a flat ride. It is fast, fun, rerideable, it has a large capacity, and a long duration. Decent set of Bumper Cars. They go relatively faster than the other ones Ive been on, and theres a lot of room so you can have fun whether you want to ram into everyone, or just evade (thats personally what I do, takes a bit more skill). Also, <3 the Steelers car. Average set of bumper cars in my opinion. I love how this is always a walk on, but the ride was just average. The cars had decent speed and good handling, but there power was slightly below average. Also, the cycle wasnt overly long as well. Maybe I am missing something here, but these bumper cars werent anything special if you ask me. It did have the pro of not having a huge line (bumper cars seem to always be popular) but the ride itself just didnt run fast enough or hit hard enough to make it anything above average. I love bumper cars, but these ones are a shame. It is ALWAYS a walk-on ride, and Im not a fan of how it is just one square without a divider. The cars are small, and painted in horrible neon colors, as with the walls. It is also a fairly short ride cycle. The cars dont hit too hard and whenever I go on them, there are only few working ones, the rest of them are in the corner with OUT OF ORDER signs on them. Kennywood should really do something about this ride. Love the bumper cars! Here is a tip for everyone, dont turn the steering wheel around in circles as soon as you get in until the ride starts, HAHAH, I went in circles the whole time! 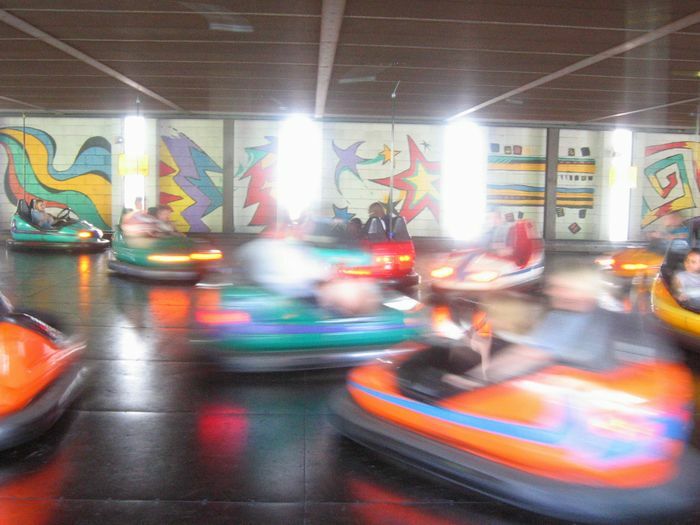 Gotta love those bumper cars. Theres just something great about driving around and bumping into people. This one is in great shape, and the cars give a nice jolt when you hit head on! I am a huge fan of bumper cars, and this one is a lot of fun! Kennywood keeps both the building and cars in excellent shape, and you get a pretty long ride on this. The walls are painted so that at night they kind of glow in the dark, which is real cool! You just cant beat driving around in a little car and smackin into people! Guaranteed fun for all ages!! !